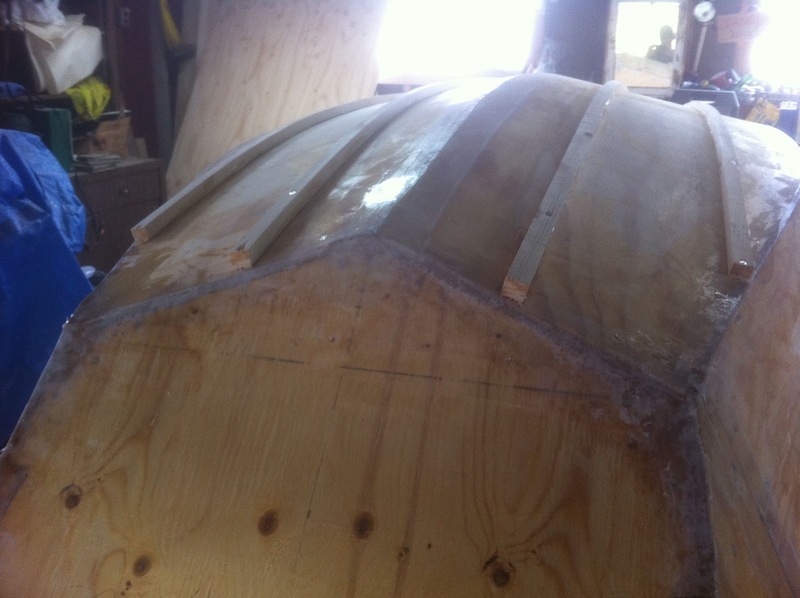 Once the interior was finished I flipped the boat back over and finished the exterior. The first task for the exterior finishing were the runners. I made these out of 3/4 x 3/4 strips of spruce. I used the dimensions on the plans to space them out, applied epoxy and screwed them into the frame pieces. Once the epoxy cured I used a plan to share the front edge of the runners so that they slopped flush at the front edge. I finished up sanding, filling, sanding, filling and more sanding until the bottom was fair and smooth. 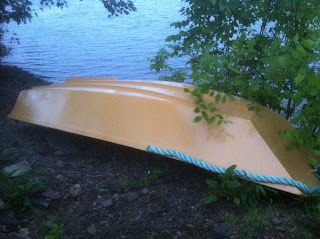 I applied the same primer and yellow boat paint to the bottom of the boat. I used 3 coats of paint. I applied a name to the back (because every boat deserves a name!) using black paint. I chose the name Mâthos since my sailboat is named Salammbô and Mâthos was her lover. Once dry I fitted the remaining hardware (cleats and oarlocks) as well as adding a bump rail to the gunwales. For the bump rail I used 1" rope tie wrapped to the gunwales. I am exceptionally happy with how Mâthos turned out. She is a very good rowing boat, pulls very well behind the sailboat and is remarkably stable. 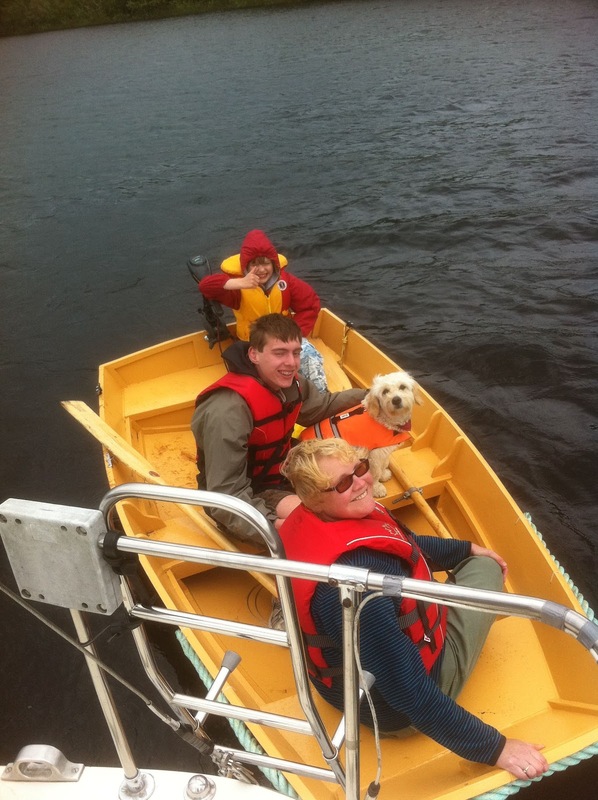 I can fit my family of 4, our dog and a days supplies in her and still have 6" or freeboard (approx 645lbs). I wouldn't want to go out in rough water with that much weight though! I've had her with one other person in heavy waves with no issue at all. A very dry tender. I have also purchased a small 30lbs thrust electric motor to use on the back of her and it works very well for ferrying us out to the mooring with no effort. I would highly recommend John Gardner's "A plywood Pram". The instructions in his book are a little sparse but the boat comes together well. 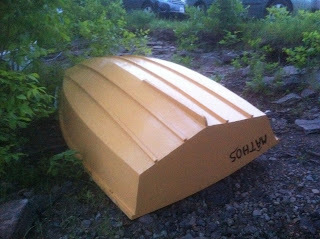 If you attempt a build of the boat and have any questions about how I did something, please ask. I'll answer the question as best I can and update these pages as appropriate as well. I would also welcome additions/amendments to my instructions. This has worked out well with my loft bed plans. Collaboration with a couple of builders has made the instructions much more useful.